One might wonder why he would even work for Kaiba at all, but what better way to earn money than being the most-expensive duelist on Duel Cafe's "menu"? 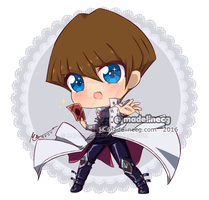 Kaiba conveniently forgot to mention that there would be more involved. HEY KAIBA. HOW'D YOU LIKE TO OWN A PUNCH IN THE FACE! Kaiba would do that if he could. If you can't beat 'em, own 'em. Hahaha, I would love to know what everyone else's assignments were!